Andrew Smith focuses his practice on civil litigation. Andrew has extensive experience in all aspects of litigation, specializing in business litigation, construction litigation, personal injury and sexual harassment cases. 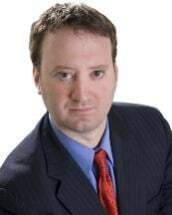 He co-founded the firm Smith + Schwartzstein LLC in 2009 and has successfully represented numerous clients throughout the state of New Jersey and New York, practicing in State and Federal Court, including before the United States Supreme Court. He has lectured for the Practicing Law Institute, NY Bar Association and Fordham University. Andrew was named for three consecutive years to the New Jersey Super Lawyers Rising Stars List and on The Best Lawyers in America list for 2018. Andrew graduated from Rochester Institute of Technology with a B.A. and received his J.D. from Boston College Law School. After law school he clerked for the Honorable Sybil R. Moses, A.J.S.C. before joining the litigation department of Gibbons P.C. Before law school, Andrew served as an Artillery Officer in the United States Army, deploying to overseas locations and attaining the rank of Captain. Andrew is active in his community, and is involved in numerous civil and political activities.